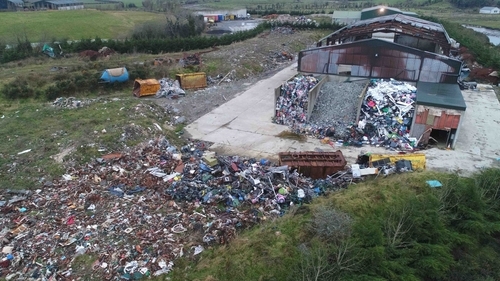 The man responsible for one of the country's worst illegal dumps has avoided jail for at least another two months after a forensic accountant acting for Donegal County Council was given permission to inspect key documents seized by gardaí in 2017. Jim Ferry, who has accepted responsibility for thousands of tonnes of waste buried on the banks of Lough Swilly, had been facing jail for Contempt of Court because of his failure to properly account for millions of Euro in profits which the Council suspect he generated from his environmental crimes. In the High Court today Mr Justice Max Barrett granted an order, agreed to by both sides in the case, which will allow the accountant inspect the documents gathered in raids carried out by gardaí in Letterkenny and the Criminal Assets Bureau. Counsel for Donegal County Council, Richard Lyons, said the order should allow the forensic accountant to prepare a report on how much money Mr Ferry from his activities and what has happened to it. This report will be brought back to the Court in late March. On that basis it was agreed that a separate order to jail Mr Ferry be put on hold until the accountant's findings can be assessed by all sides. Mr Ferry featured in the RTÉ Investigates programme Ireland's Wild Waste which broadcast last year.